I believe only Marty Seifert can defeat Mark Dayton. Because of that belief, I'm announcing my support for him to be our republican endorsed candidate. I previously, and very early, supported Scott Honour. I did so because at the time I thought a competent businessman with real ties to Minnesota, one who, for G-d's sake, was raised in a trailer, could have a real shot against the perpetually damaged Mark Dayton. Unfortunately, there was no growth in either the candidate or his campaign. I hope Scott, an honorable man, continues to be active in politics as I think he can make an important contribution to Minnesota. At the end of the day, however, his campaign wasn't enough in this cycle and we can't beat something with nothing. Seifert has undeniable appeal to Greater Minnesota and rightly so. This kind of candidate is the only way we republicans can take back the governorship. Seifert has been calm and cool in this regard. Remember: he got into this race relatively late. All the better for his cool head. That bespeaks a confidence not found in other candidates. 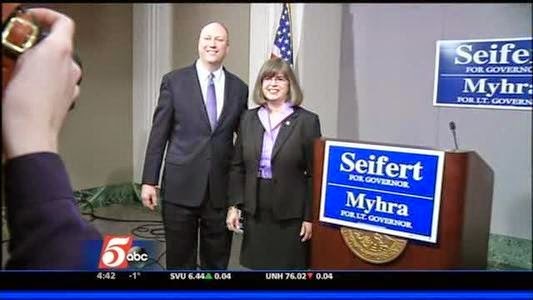 Seifert has the only balanced ticket. Geography and gender matter, no matter how much that makes me roll my eyes: it remains true and these things count. They count if you want to win. The issues also favor a Seifert/Myhra ticket: mining in the northeast of the state, the ridiculous light rail projects that are disfiguring our two major cities and environs, and the malignant Met Council. This is a ticket that can reach out and get independent and moderate democrat voters. Any republican who wants to win must be able to do so. Marty Seifert can bring the fight to Mark Dayton. Money alone can't win races although this is heresy in some republican circles this cycle. But it's true. A good candidate is fundamental. The old rules still apply. Seifert knows this. Seifert can win. This weekend in Rochester, I encourage fellow delegates to endorse him. India's poor voted to no longer be poor. That's the level best I can do in trying to get across to Americans the scope and significance of India's election returns, which started coming in to us last night and continued throughout the day. The scope of Narendra Modi's victory can hardly be overstated. In fact, it left virtually all political observers in and out of India grasping for words, for metaphors, for some image that can adequately convey what is clearly a historical turning point for the world's largest democracy and, consequently, the world itself. Modi's political party, the center-right Bharatiya Janata Party or BJP, won in almost every state, in every direction throughout India, in areas where it hadn't won for a long time and in many cases where it never had before. In India's parliamentary system, a total of 272 seats are needed to form a government and for the last several decades they have been coalitions of various parties, with the Congress Party ruling for the most part. Congress is the party of Nehru, Indira Gandhi, Rajiv Gandhi and most recently Sonia Gandhi, who took over after the assassination of Rajiv, her husband. These Gandhis have no relation to India's most famous one, Mahatma Gandhi. Modi was the former Chief Minister of the state of Gujarat, population 50 million. His achievements there were nothing less than spectacular, ensuring steady power to homes and businesses, clean water, sound education to every level of society and more. In short, Gujarat worked because Modi worked. He took his tested accomplishments to the nation and, fundamentally, asked it if it wanted to stay poor under Congress and its allies or if it was ready for the future, for India's destiny. The answer astonished even the most jaded. The BJP won a governing majority outright, with 285 seats. Together with parties aligned with it, the number reaches 340 out of a total of 543 seats. India has never seen election results like this. I won't belabor the details here because I wanted to give Americans a quick understanding of this election, the consequences which will play out dramatically in the next five years. However, readers should know that in the West the backlash against Modi has already begun. Why might this be? Because India has slaughtered liberalism on a scale unprecedented in the modern age. Everything generally liberal or progressive in the West was embodied in the Congress Party. A nation of more than one billion has turned its back on it; from this there is no return. Consequently liberals in the West, in the media and academe, will say the usual tired things about Modi they said about Reagan, or Thatcher, or to a lesser extent Deng Xiaoping, each a leader who transformed their country. Don't buy the criticism, especially that Modi ignored communal rioting in 2002 that left many dead, mostly Muslims. That charge has been thoroughly vetted in India and was found to be without merit. This doesn't stop Westernized Indian liberals like the ridiculous Pankaj Mishra from claiming the world's largest democracy just elected a mass murderer. Right. Couldn't he at least have worked in climate change to the mix? In America, the once respected magazine The New Republic was hot off the blocks in making a similar but less pointed case against Modi. Yes, that's all they've got but a wholesale rejection of liberalism in India puts the entire world's liberal agenda in peril. Good. While I said at the start that India's poor no longer wished to remain so, clearly most other segments of society in the world's most diverse country also saw something in voting for Modi. There is no other way to explain 340 seats in parliament. Remember this when the intellectual thugs and despots of the Left come calling to trash this election and results. 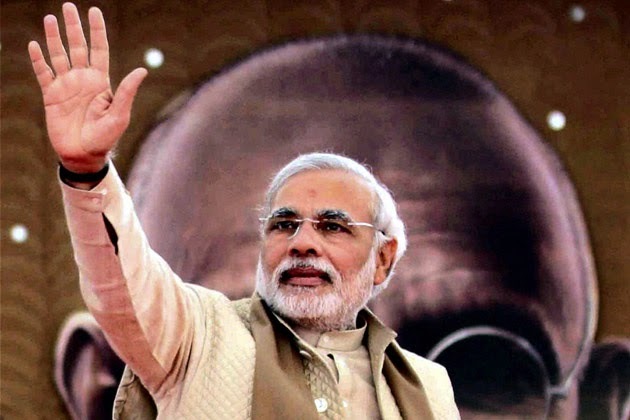 Yet, if you're for the advancement of the human condition, if you're for the dignity of the human person, if you're for compassion instead of suffering, if you're for the equality of women, if you're for the advancement of culture, technology and knowledge, you'll welcome the advent of Prime Minister Modi. But mostly, here's to the average Indian voter, literate or illiterate, who had the courage and genius to realize that the future does not come often in elections and as a nation seized it with both hands. The political mise-en-scène was to have an accomplished private sector man with no record, capable of being programmed by Norm Coleman and Vin Weber to be a plausible alternative to Al Franken, thereby clearing the field of competitors and uniting the Minnesota republican party after a cycle controlled by Ron Paul zealots now returned to party regulars. The Cipher Candidate™ would mouth enough generic platitudes to convince the activist base to fall in behind him and the large money needed in order to take out Franken would flow, the implicit representation being that here was a guy who could self-fund if needed (never true). Before that scene could be shot, however, reality intervened, leaving the script in tatters. The first thing anyone learned about the previously unheard of McFadden was that he was wealthy (he's more like Euro trash wealthy; he's not, for example, Alida Rockefeller "we don't smile we're so wealthy"). The second thing you learned about him was that he was going to a primary, period. Curiously little attention or thought was given by the base and activists to this arrogant pronunciamento. If he's so great, wouldn't he win the endorsement by acclamation? To be fair, the last time a republican endorsing convention offered up a senate candidate they gave Minnesota Kurt Bills, so one can't fault the men behind the curtain from being leery. But two years is a long time in politics and if either of these influence peddlers without scruples had been paying attention, they'd have realized May 2012 in St. Cloud was the Paulers' high water mark. For a trip down memory lane, you can read what I wrote about it at the time, "What I Saw At The Hemp & Raw Milk Revolution," by clicking here. The McFadden campaign, however, has turned out to be a case study in tone deaf kingmakers, money men, consultants and staff. I realize Mike's the actual candidate but I put him last in assigning blame for the ridiculous show to which Minnesota republicans have thus far been treated. Somehow, in my heart of hearts, I just know he was told it would be very different. The decision was made to keep McFadden from much exposure to the base. This was very stupid, but Vin Weber crowed to MinnPost that it was exactly the right move, keeping him on the phone dialing for dollars. The reporter never thought to ask Weber why the candidate couldn't have done both; most do. As a result, the ones McFadden most needed to get to know never got a chance to meet him. As time wore on, it became clear that it was actually McFadden who desperately needed the exposure to the base, not the other way around. Having squandered virtually all of 2013 by keeping him under wraps, his consultant driven handlers tried deploying him as a real person in 2014 with increasingly disastrous results. The two most recent events should suffice as I've blogged about this campaign for some time and interested readers can click on the archives to the right should they wish to read that analysis. The first involves McFadden campaign manager Brad Herold traveling to Washington, DC to hold a press availability about the career of Mike McFadden, without the career guy himself present. This was bizarre but in the cloistered world of consultants it somehow made sense. OK then. The campaign tried to thread the needle between different types of equity: investment bankers (McFadden) as opposed to private equity (Mitt Romney). The point of the event was to make the useless, and graceless, point that McFadden isn't Romney. I look forward to another such event where they try to differentiate the unknown McFadden from, say, David Duke. Why not? You never know what that dastardly Al Franken may throw our hero's way! And isn't always being on defense the best way to win an election? The Star Tribune's story can be read by clicking here. McFadden's Twitter supporters were left to critique the media, which is a topic I pretty much own in this town but anything to avoid blaming an awful campaign. The second recent event involved Mike as Daniel: into the den of Tea Partiers went he. I actually was fascinated by this decision when it was announced a week or ten days ago (who can keep track of time, especially when on Twitter a lot?). Jake Duesenberg & Jack Rogers have ginned up the Tea Party in Minnesota this cycle. While I'm not a per se Tea Party republican, I welcome everyone into the tent who wants to defeat democrats. Jake & Jack had previously been rather harsh on Mike for avoiding the Tea Party and the conservative base. 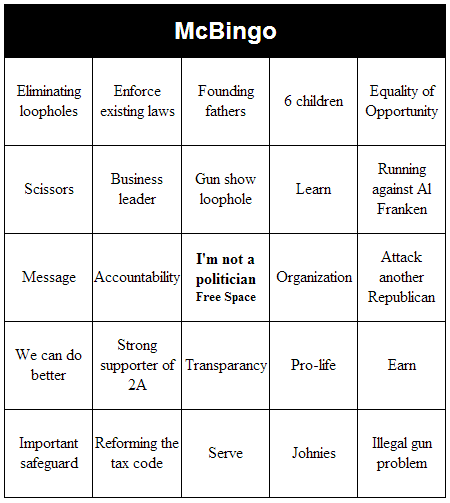 Hence the about face of the McFadden team to have Mike address the North Metro Tea Party last week made me wonder if they couldn't yet get it together. Turns out they couldn't and then some. Disastrously so. How could The Borg not prepare MM for what he would encounter there? How could he so obviously filibuster in order to avoid answering questions? How could he be so cringe-inducingly unprepared to answer just the basics? Why bother to attend when he said he needed to leave after a mere 40 minutes? Even then, after getting off the stage, he mixed with attendees as Duesenberg asked him from the stage if he hadn't said he needed to get going? This was after McFadden called for an end to the republican circular firing squad only to have a boisterous member of the audience point out that going to a primary constitutes holding the gun. Before the event staffers patrolled the premises attempting to keep people from recording him. Remember, it's the smart set running this campaign. Worse, how could one of McFadden's high ranking aides appear to threaten Duesenberg? That, at least, is the allegation. From a public relations standpoint, this appearance could not have gone worse if Al Franken was in disguise advising. The Star Tribune's Rachel Stassen-Berger wrote up the proceedings which can be read by clicking here. Jake Duesenberg put his own thoughts together on Facebook, which can be read by clicking here. A depressingly large number of republicans have bought into this dog and pony show; their better judgment clearly eclipsed. Some of them are my friends; some of them used to be. Funny, that. At the end of the day, however, almost all of them know, at some level or another, that the guy they saw stumble through his own press conference last month can't beat Al Franken. They've already signed onto the effort, however, and see no realistic (for them) reason to either abandon this sinking ship or switch outright to another candidate. So they bide their time, thinking the endorsement means nothing and that the primary will vindicate their readiness to be bought. Except that McFadden winning the primary is another word for Franken winning the general. And for their dishonesty in refusing to admit that there is still time to select another, infinitely more qualified and viable candidate, I cannot forgive them.